Home » Get Creative With Us! Women’s Lives Leeds is hosting a CREATIVE DAY with activities facilitated by Leeds Arts University. We will be having fun by using different methods and skills to create artworks which will celebrate how we, as women, can be powerful; how we can use our voices and experiences to influence change. Members of the Women’s Lives Leeds service user advisory board will be present to talk about how they are getting involved in voice and influence, and how you might like to join them. The event is open to any woman who accesses, or has in the past accessed, any of the services offered by any of WLL partners. No experience is necessary. The event is child friendly and you can bring small children (however if you plan to do this – please let us know so we can bring enough toys)! The day is free and there is no cost for any of the materials provided for the craft and artwork. You can take your artwork home with you although you will be invited to bring it back later in the year when we will be hosting a special exhibition to celebrate all the creative projects WLL have undertaken with Leeds Art University through the year. You will also be invited back to both the exhibition and also to get involved with the advisory board and other opportunities with WLL . We will spend a few hours making things and then relax and share lunch together, which is also provided free of charge. 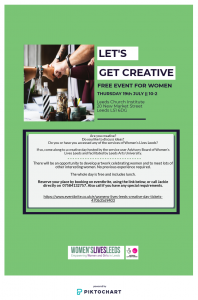 You can reserve your place by either clicking on https://www.eventbrite.co.uk/e/womens-lives-leeds-creative-day-tickets-47063569403 or you can call Jackie on 07584132757 to discuss any special requirements. Also feel free to call Jackie if you have any questions or concerns around attending.